Dr Syal Kumar, an Ayurveda doctor hailing from Ernakulam, has been the head of the department for Indian medicine at University Duisburg–Essen in Germany since 2009. In an interview to Vinod Nedumudy, he says that there is increasing acceptance for Ayurveda in Germany. However, there is still lack of a standardised protocol for practising. Q. How did you choose the research topic? I work in a university hospital for integrative medicine established in 1999, which started as a model hospital for the German state NRW. After 5 years of scientific evaluation from the university board, the first German Chair for Complementary and Integrative Medicine was founded by the Alfried Krupp von Bohlen and Halbach-Foundation at the University hospital Duisburg-Essen in 2004 headed by Prof. G.Dobos. The chair paved the way to develop a standardized, natural and integrative medicine syllabus for medical students. In our hospital along with modern medicine, European natural medicine, Chinese medicine (TCM), Traditional Indian medicine- Ayurveda (TIM), Mind body medicine play a major role in patient management. In 2009, the Chair invited me to establish the department of Indian Medicine- Ayurveda with a major focus on patient management, research, publication and education. During my work along with colleges from other departments with the concept integrative medicine, I came across many positive and negative experiences which inspired me to select this topic. Q. What is the concept of Integrative Medicine at your hospital? We try to give the best possible therapy for the patient from available medical systems. We selectively combine different medical system treatments or stick to the most effective medical system. In our experience, chronic diseases can be treated well with traditional medicines like TCM, TIM, European herbal medicine and mind body medicine. TIM has room for the Integrative concept. Diseases that are treated with TIM are muscle and joint diseases, gastro Intestinal diseases, dermatological diseases, psychiatric diseases and neurological disease. Leech therapy is a good example of our integrative approach. The clinical study on leech therapy was published from our hospital in the journal Annals of Internal Medicine. With TIM, we try to stick to serious Ayurvedic treatment concepts that are followed in reputed hospitals in Kerala. Q. How can Ayurveda contribute in the integrative medicine field? The effectiveness of Ayurveda is its preventive and curative aspects. The concept of food and activities, according to the disease condition and the internal classical medication, has got a big role in the integrative concept. This can be administered carefully along with other medical systems like conventional medicine (modern medicine). Panchakarma treatment is an effective treatment method because no other medical system has got the chance to purify the tissues like Ayurveda does. This also can be integrated effectively along with conventional medicine. In certain acute situations and for surgical treatments, conventional medicine is the best choice. Conventional medicine frequently relies on lifelong medication, on which patients come to depend. Many medications have side-effects, and withdrawal symptoms that, if the medications are later discontinued, can become problematic. In such circumstances, Ayurveda can be integrated well. Patients generally respond well to Ayurvedic treatments, experiencing a reduction, and sometimes even a cessation, of their symptoms. It is seen in patients that after Ayurvedic treatment, conventional medicines act better than before, whereby a reduction in the dose can be achieved. Q. What are the details of your research? Though Ayurveda is popular in different parts of the world, especially in Germany, there is no standardized protocol to practice Ayurveda, anyone can practice anything in the name of Ayurveda! During my stay of 14 years in Germany I feel that Ayurveda has to be integrated properly and effectively among doctors who are into natural and integrative medicine. The study was started in 2013 and was completed in 2016. It was an exploratory research focusing on the potential for integrating far eastern medicine into western medicine. Based on Grounded Theory (Glaser & Strauss 1967, Straus & Corbin 1990), different methods are combined according to the concept of triangulation (Flick 2008). At the beginning of the study, qualitative expert interviews and problem centred interviews were conducted. Study participants were doctors who were practicing Ayurvedic medicine according to the inclusion criteria and were practicing in India and in different regions of Germany. German doctors who practice Ayurveda in their private practices were interviewed in focus groups, in order to focus on the aspect of integration and ambivalences in the process. All the interviews were tape-recorded, transcribed verbatim and analyzed using Grounded Theory methods. Observation protocols were analyzed with the computer software Maxqda also using Grounded Theory methods. 1. How is Ayurveda medicine integrated in the German medical system? 2. How is Ayurveda medicine being practiced and how authentic is this system in Germany? 3. What is the quality of practicing and education of Ayurveda in Germany? 4. Is there any difference in the practice of Ayurveda depending on individual practitioners? 5. 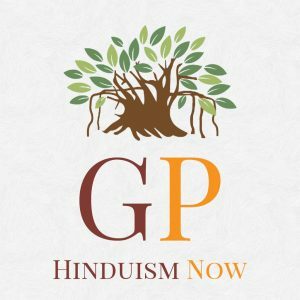 What are the qualifications needed to practice Ayurveda medicine and the authenticity of courses being conducted in Germany? 6. 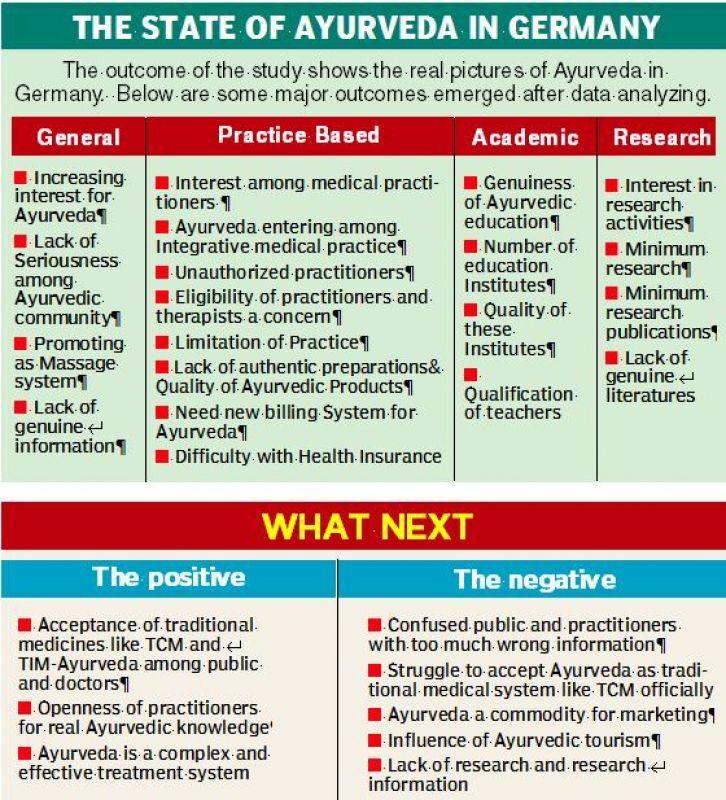 What are the challenges faced in practicing Ayurveda medicine and the difficulties for its integration in the German health system? According to Ayurvedic classics, there are four limbs which support this system. The physician (bhishak), medication (dravya), attendant/therapist (upastata) and patient (rogi). Questions of the interview were created also considering the above four areas. This helped to analyse the Ayurvedic system in depth. Q. What are your recommendations in the study? These standards will aim at internationally functioning clinics and hospitals, doctors, research centres and education institutions. a) An authority can be formed in India who can grant approval for Ayurvedic clinics and hospitals, doctors, research centres and educational institutes working in other countries according to fixed standards. The authority’s office should be under the Indian Government with members having minimum Ayurveda MD qualifications. The authority can appoint one person, a qualified Ayurvedic doctor who studied in India with MD who works in respective countries, as its representative / contact person and will be closely associated with Indian Embassy. b) Certification process: Ayurvedic hospitals, clinics, doctors, research centres and educational institutes will be subjected to inspection by local authorities. Depending on this report, the Indian authority will take an appropriate decision and further certification. The local authorities will work in close contact with the Indian embassy. c) Health ministries of different countries could accept this certificate as a benchmark for Ayurveda and could further inform respective departments and the public. I think this will help to standardize Ayurveda, thereby doctors can learn well and patients get quality treatment. The ideal medicine is that which helps the patients – whether or not it is classified as conventional, CAM or traditional. This integrative approach of treatment will be the future of medicine and the best way to get rid of ailments.